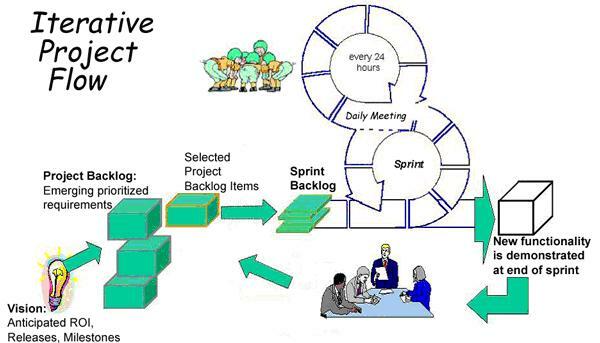 Scrum is a project management method for agile software development. Although Scrum was intended to be for management of software development projects, it can be used in running software maintenance teams, or as a program management approach: Scrum of Scrums. The approach was first described by Hirotaka Takeuchi and Ikujiro Nonaka in The New New Product Development Game (Harvard Business Review, Jan-Feb 1986). They noted that projects using small, cross-functional teams historically produce the best results, and referred to this as the “rugby approach”. In 1991, DeGrace and Stahl, in Wicked Problems, Righteous Solutions referred to this approach as Scrum, a rugby term mentioned in the article by Takeuchi and Nonaka. Ken Schwaber used an approach that led to Scrum at his company, Advanced Development Methods, in the early 1990s. At the same time, Jeff Sutherland developed a similar approach at Easel Corporation and was the first to call it Scrum. Sutherland and Schwaber jointly presented a paper describing Scrum at OOPSLA ’96 in Austin, its first public appearance. Schwaber and Sutherland collaborated during the following years to merge the above writings, their experiences, and industry best practices into what is now known as Scrum. Schwaber teamed up with Mike Beedle in 2001 to write up the method in the book Agile Software Development with SCRUM. Scrum is a process skeleton that includes a set of practices and predefined roles. What members did since last meeting? What they plan to do till next meeting?